Endocrine Disruptors and Obesogens – Much of the research on the epigenetic saboteurs are thanks to this incredible researcher – Dr. Bruce Blumberg. Further to our previous show with Dreamfilm Producer Bruce Mohun of “Programmed to be Fat” A David Suzuki Nature of Things production – Today we at Best In Health Radio brings you Dr. Bruce Blumberg – whose research was at the Center of this fascinating show. Bruce Blumberg received the Ph.D. from the University of California, Los Angeles in 1987. His postdoctoral training was in the molecular embryology of vertebrate development at the Department of Biological Chemistry in the UCLA Medical School from 1988-1992. Dr. Blumberg was appointed as a Staff Scientist at The Salk Institute for Biological Studies, La Jolla, CA in 1992 where he focused on the molecular endocrinology of orphan nuclear receptors and their role in embryonic development and adult physiology. Dr. Blumberg joined the faculty at U.C., Irvine in 1998 where he is currently Professor of Developmental and Cell Biology, Pharmaceutical Sciences and Biomedical Engineering. His current research focuses on the role of nuclear hormone receptors in development, physiology and disease. Particular interests include patterning of the vertebrate nervous system, the differential effects of endocrine disrupting chemicals on laboratory model organisms compared with humans, interactions between xenobiotic metabolism, inflammation, and cancer, and the role of environmental endocrine disrupting chemicals on the development of obesity and diabetes. 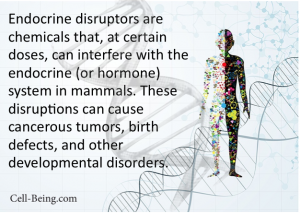 Dr. Blumberg and his colleagues originated the obesogen hypothesis which holds that developmental exposure to endocrine disrupting chemicals can induce permanent physiological changes. EDC exposure elicits epigenetic alterations in gene expression that reprogram stem cell fate to favor the development of fat cells. Exposed animals are predisposed to develop more and larger fat cells, despite normal diet and exercise which is likely to lead to weight gain and obesity over time. I was very happy to discover this web site. I want to to thank you for ones time due to this fantastic read! !